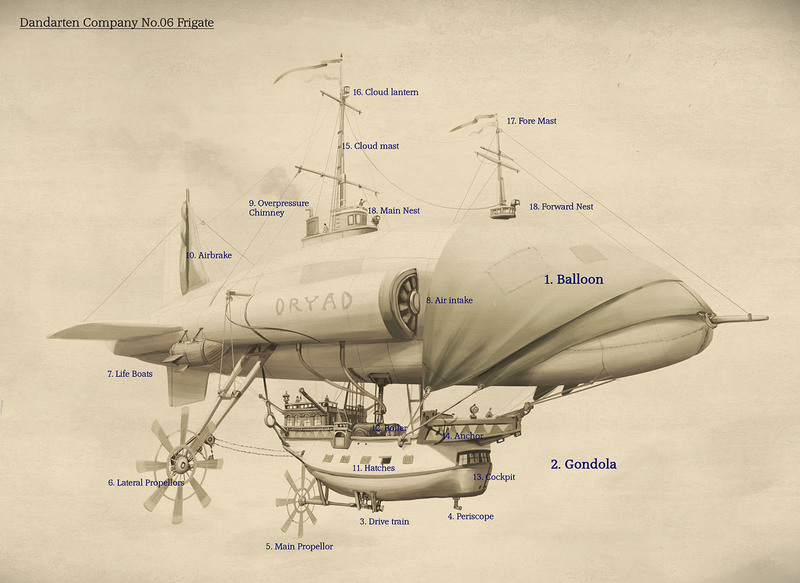 Behold, a labelled diagram of a steampunk airship. I shall now proceed to address the points of most importance concerning it’s proper operation. Altitude is increased by increasing the buoyancy of the gas filled lift cells in the balloon (1)- these respond to heat energy from the boiler (12) by decreasing in density and therefore gaining lift. Lift gas is replenished and generated on-board the vessel via the algae tanks (not visible). Combined action of the chain driven Lateral propellers (6) drives the craft forward or backwards when equal power is delivered to both sides of the craft. Yaw is achieved by increasing the relative amount of power (via gear transmission) to one side of the craft at a time: Higher power to the right propeller turns the ship to the left and higher power to the left propeller turns the ship right. The ship also possesses a central “main propeller” which provides less thrust than than the lateral propellers while in the air but is adapted to work well when submerged- allowing the craft to move efficiently on water. In situations where the ship is required to rapidly lose velocity the airbrake (10) can be deployed: releasing tension on the brake lines allows the brake to fold out from the tail like a fan- increasing air resistance and slowing the craft. Conversely- the airbrake can also be used as a sail to increase the speed of the craft and conserve fuel when sailing along the wind. The pilot flies the ship from the front cockpit (13)- with assistance of the crew. A periscope (4) allows the pilot to see directly beneath the ship at all times- even when resting on water. Orders are received from the captain and transmitted to the crew via speaking pipes (airships are obviously very loud). The pilot’s job is to control the speed and direction of the craft while the engineers ensure the engines, pumps gears and other apparatus are working correctly. Engine power is achieved via modern steam turbine engines using liquid fuel- this frees up space versus traditional gas fuels and weight versus solid fuels. The engines and fuel tanks (not visible) are located towards the bottom and centre of the ship to help maintain the correct centre of gravity. The engines drive the lateral and main propeller via chain drive trains. The chain drive method allows the Lateral propellers (6) to be folded up and out of the way when the airship docks. This airship is designed to land on water. Water intakes on the drive train (3) also allow the boilers and algae tanks to be conveniently refilled while the ship is at rest. 4. Anchor– To anchor the ship- when a hangar isn’t available. 18. Nests- These are used to ensure visibility around the craft at all times- the lookouts communicate with the crew in the gondola via speaking tube. *I am not responsible for any injuries deaths etc. resulting from attempting to put this technology into practice. Always seek professional help when piloting steampunk airships.